The Yorkshire Dales are incredibly dog-friendly, with many true dog-lovers very keen to welcome you and your pooch. ​Here is just a selection of our dog-friendly accommodation, ranging from a four-poster bed for your your four-legged friend in one of the Dales' best hotels to self-catering cottages, lodges and holiday parks. When you're out and about look out for these dog-friendly cafes, pubs & tea rooms. The Devonshire Arms Hotel & Spa is very dog friendly, having recently been awarded the title of Pampered Pet in PetsPyjamas 2017 Dog-Friendly Travel Awards. We are a supreme country house hotel, with 40 individually designed bedrooms and two award-winning restaurants. Experience the luxury of an escape to your ultimate getaway, cosy rooms, fantastic food and our own little haven: Spa at the Dev. Come and join us with your four-legged friend - you’ll love it! We even have a pet concierge service at reception! Also provided are blankets, bedding, bowls, spare leads and throws also doggie four-poster beds are available. A washing station is located outside the hotel with a bucket, sponge and towels for freshening up after long walks through the Yorkshire Dales. The Devonshire Fell is a dog friendly vibrant country hotel with stunning views of the Yorkshire Dales and offers some of the finest dog-walking country, so your pet will love it! Set in the picturesque village of Burnsall, our impressive Edwardian building is distinctly different from other Yorkshire Dales hotels. Styled to offer city chic in the countryside, you’ll find vibrant colours and a contemporary style. Elegant and luxurious, the hotel boasts a 1AA Rosette restaurant, 16 individually styled rooms, plus guests can enjoy complimentary access to the Devonshire Spa on the Bolton Abbey Estate. Low Mill Guesthouse is a grade 2 stone built watermill with 3 unique and luxurious bedrooms situated in the heart of the Dales. We offer dinner, bed and breakfast and have a working waterwheel which operates some of the original mill equipment throughout the property We have a lovely riverside garden We are perfect for that special night away with your beloved monster! The magnificent Simonstone Hall country house in Hawes is also very dog-friendly with bar treats, towels and dog-friendly walks and bedrooms! Enjoy the grand surroundings and luxurious spa, the superb dining and luxury bedrooms during your stay. Staff love their dogs as much as you do yours, and they will receive a warm welcome and special snacks in the hotel bar. The Fleece Hotel, Richmond is a stylish new addition to the popular bustling Dales market town. 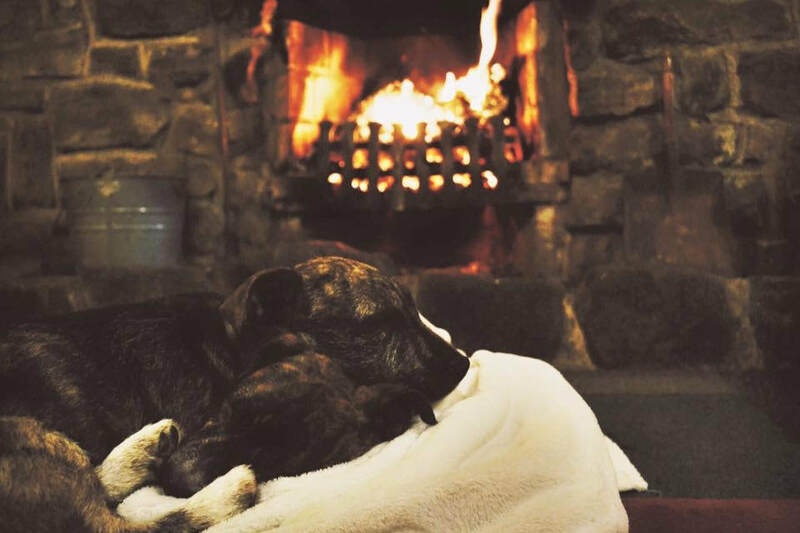 We welcome canine guests here at The Fleece and have two bedrooms specially designated for dogs and their owners. We provide wet day dog packs including towels for a good rub down if you forget yours, and if you need any extra supplies, such as dog food, toys, bedding etc. then these can be purchased from J & H Meynell's on Finkle Street – a short two minute walk from the hotel. Your well-behaved pet is fine to join you relaxing, wining or dining. in our ground floor Café/ Bar area. Most of our staff love our furry friends so please don’t be offended by the amount of cuddles you will receive and enjoy your stay! If camping and caravanning is your favourite way to spend time in the Yorkshire Dales then Colman's of Aysgarth is perfect for you and your family. We have a dog-friendly camping and caravan site in the Wensleydale idyll of Aysgarth, as well as a lovely B&B. A family-run, home-from-home we offer luxury B&B guest accommodation as well as ‘properly thought about’ facilities for camping and caravans. We do beautiful views, a true Yorkshire welcome, relaxation and fresh air. We don’t do ‘theme’ weekends, organised activities or suffocating rules! Town End Farm Cottages: Our three holiday cottages in a traditional converted barn all have separate secure enclosed gardens with views towards Malham Cove. Great walks from the doorstep and we do ask that dogs aren't left alone, allowed on the furniture or allowed upstairs. Stair gates supplied if necessary and poo bags! Studfold Caravan, Glamping and Camping Park Lofthouse, Harrogate is dog friendly. Glamping pod 2 has its own dog pod kennel too! We do ask that dogs are never left unattended on their own, kept on leads, walked off the park and pick up poo! Lots of fantastic walks in and around Nidderdale with 2 dog friendly pubs nearby! Crown Cottage Farm, Embsay, Skipton. We have a Shepherds Hut that is self catering. We allow 1 well behaved dog to stay in the hut with you. The Shepherds Hut had its own garden area. 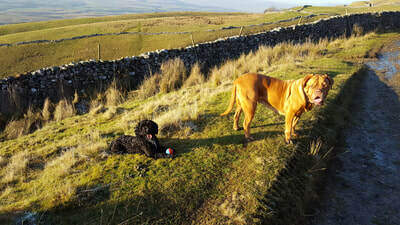 There is also a good dog walk around Embsay reservoir on your door step. Herriots Hotel with Rhubarb Restaurant, Broughton Road, Skipton. We have a small number of dog friendly rooms across our room types offering dog blanket and treats. Price is £10 extra per night. Although not allowed in the Rhubarb Restaurant, dogs are allowed in the bar, conservatory and courtyard if kept on a lead and well behaved. The Lodges at Artlegarth is located near the village of Ravenstonedale. We have six real log cabins on our private seven acre site, all with hot tubs and all pet friendly. Canine guests are welcomed with dog treats and their own mango wood bowl stand. The local pubs also allow dogs inside, perfect if you take a stroll to the village and want to stop for a drink or a bite to eat. The Wheatsheaf at Carperby near Leyburn in Wensleydale understand that when people visit the Yorkshire Dales they want to share the experience with their dogs. 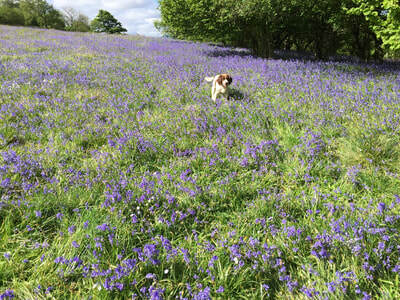 With fantastic walks to explore all around we welcome you and your dog in many of our rooms. Shepherds Cottage, near Hawes: Dogs welcome at this cottage which stands in a half acre paddock. Not allowed on the furniture or upstairs and must not be left unaccompanied in the cottage. Warm kitchen with Rayburn for them to sleep in. Lovely walks on the doorstep in Wensleydale. Woodlands, Giggleswick, is a large self catering house sleeping up to 19 guests in 10 bedrooms. There is no restriction on the number of dogs that can stay. With good long walking country and Settle market town nearby, you have lots of scope to explore. Hazel Brow House, Low Row in Swaledale, Period property accommodating 15 guests and up to 2 dogs by arrangement. Dogs are welcome to roam the ground floor of the property so your 4 legged family members can be in your company through the day. We don’t allow dogs upstairs or on the furniture but we do provide a spacious boot room equipped with HiK9 mesh bed, towel and large dog crate if required (please request on booking). Raydale Barn is an isolated rural camping barn in the heart of the Yorkshire Dales. We can accommodate up to 16 people, we’re dog friendly and completely off-grid; perfect for a mini adventure or two. Bramble Bottom Cottage, Muker, upper Swaledale. Gorgeous upside down cottage to sleep 10 with cathedral effect lounge/kitchen/diner on top floor with great views, squishy sofas, stunning dining table and wood burner. We welcome two medium sized dogs in all rooms. Enclosed patio leading on to small village green. Dog bowls and waste bags provided. Lovely Seat Cottage, near Muker, upper Swaledale, Yorkshire Dales. Traditional cottage with lovely stone walls, cosy wood burner and private balcony with stunning panoramic views of upper Swaledale. We welcome two medium or one large dog at no extra charge in all rooms except the bedroom. Five acre meadow, small woodland, dog bowls, hi-viz (for humans and pooches), waste bags, water carrier and welcome biccies! Kisdon Cottage, near Muker, upper Swaledale, Yorkshire Dales. Beautiful contemporary cottage with stunning panoramic views of upper Swaledale. We welcome one medium or two little dogs at no extra charge in all rooms except the bedroom. Five acre meadow, small woodland, dog bowls, hi vis (for humans and pooches), waste bags, water carrier and welcome biccies! West Close Cottage and Field Cottage in Melmerby, Leyburn. Two dog friendly stone cottages each sleeping up to 4 guests. Up to 2 dogs allowed per cottage in living accommodation (but not in bedrooms). Spectacular views and large amount of walking from the cottages as well as the nearby Middleham gallops for exercising the dogs off the lead. Each cottage has a conservatory, free wifi access and log burning stoves. Akebar is an exceptionally family friendly Holiday Park, we have a fabulous onsite pub – The Friars Head, a Golf Course, great park facilities and we always welcome well-behaved dogs to come and stay as well. We provide a specially designated 3 acre dog exercise area, and dogs are also welcome in the bar area of The Friars Head. There is a small fee of £1.00 per dog per night. Alpine Cottages, Reeth in the centre of Reeth welcomes 2 well behaved dogs to our apartment, sleeps 4/5 in 2 bedrooms. Secure private garden to the back of the property with games room. Dog wash/towels/sponges/toys for the garden provided. Several pubs/cafes very near - all dog friendly, and countless beautiful walks from the doorstep. Westfields Farm, Moor Road, Bellerby. A small family run B&B in the heart of Wensleydale. We offer dog friendly bed and accommodation in our 'Clover' room which is a beautiful luxury super king bedroom. The Traddock is a small family run hotel, dedicated to offering our guests the best the Yorkshire Dales have to offer - top quality produce and cooking, warm welcoming hospitality and a relaxing and homely place to rest and recharge. The Traddock welcomes dogs into all our rooms with up to a maximum of 2 dogs per room. We have 2 good sized lawns in the hotel grounds for exercise and for days out, there is an immense variety of walks in the surrounding Yorkshire Dales National Park. For a piece of Wensleydale history in the heart of Hawes, Mill Fosse Cottage offers luxury dog friendly accommodation. Previously part of the original creamery, it has flagstone and wood floors which are perfect for dogs, with towels and treats for that special member of the family. A charming 18th century holiday cottage in the conservation village of Castle Bolton, Lawson's Studio has a picturesque view of Wensleydale. Nestled alongside the village green and facing South, this quirky former artist's studio enjoys stunning panoramas and is perfect for you and your dogs to stay. The Jonas Centre has self-catering log cabins for dogs and well-behaved humans. Dog gates provided so you can sit with your cabin door open and enjoy the fresh Dales air. 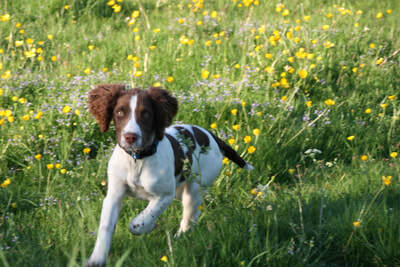 We also have a dog running free area which is enclosed and has plenty of rabbits to chase too! Layhead Farm Cottages - self-catering cottages, Rathmell, near Settle. I am happy to welcome well-behaved dogs in the cottages. Lovely walks from the cottages including Ribble Way. Dogs must be kept on leads when onsite. The Old Deanery: Our 11 bedroom hotel based in the heart of Ripon, North Yorkshire, permits dogs in all of our bedrooms and also the bar area. We charge £5.00 per dog, per night and all our staff love having your four-legged friends staying with us! Country Hideaways have several dog friendly cottages: Hay Barn near Grewlethorpe, Green Bank in West Burton, Clipstone Cottage in Masham, Briar Cottage in Middleham, the Bield in Thornton Rust, and Avenue Cottage in Masham. Masons Campsite, Appletreewick. We allow dogs anywhere on our campsite including in our glamping accommodation. There are some fantastic dog friendly walks on our doorstep here too. Exploring Sedbergh and surrounds in the Yorkshire Dales? Howgills Accommodation welcome dogs at both Howgills Barn and Howgills Apartments and there are links on our websites to help you find great dog walks and dog friendly venues and cafes here in Sedbergh.